HAMILTON -- An identification officer has told the trial of two men accused of killing Tim Bosma she found blood inside the Hamilton man's pickup truck. Det. Const. Laura McLellan of Halton Regional Police says she found blood throughout Bosma's truck when she first examined it on May 15, 2013. Bosma disappeared on the night of May 6, 2013 after taking two strangers on a test drive of a black Dodge Ram pickup truck he was trying to sell. His body was found more than a week later burned beyond recognition. 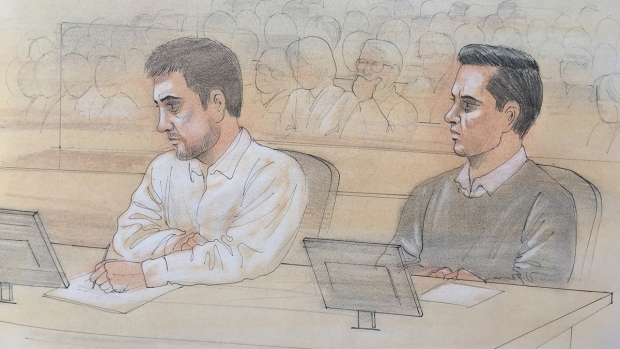 Dellen Millard, 30, of Toronto, and Mark Smich, 28, from Oakville, Ont., have pleaded not guilty to first-degree murder in the death of the Hamilton man. McLellan says she and other officers sent 64 swabs of blood from the truck and contents of the trailer it was found in to the Centre of Forensic Sciences for further analysis. She says blood was found on the front passenger side, on the dash, in the cracks of the truck's vinyl and above the driver's side. McLellan said she didn't even need the orange goggles and special laser to see the dark stains that field tests indicated were blood. Court also saw numerous photos McLellan took of the trailer, which belonged to Millardair, an aviation company owned by Millard, and of Bosma's truck. One showed burned out seats that were in the trailer and covered by a green tarp. Another showed much of the inside of the truck, which had no carpeting, and only back seats -- which were folded up. There were three green tarps in the bed of truck along with the truck's headlights, taillights and its identifying emblems. She said they detected blood on two parts of one of the tarps, which were also sent for further analysis. Earlier Thursday, Phil Wilkinson, a cellphone expert with the Ontario Provincial Police described the movements of phones registered to Millard and Smich in the hours and days following Bosma's disappearance. Shortly after midnight on May 7, Wilkinson said Millard's phone pinged off cell towers near Millardair, the company owned by Millard and operated out of a hangar at the Region of Waterloo International Airport. Crown Attorney Craig Fraser methodically laid out maps made by Wilkinson that showed the movements of Millard and Smich's phones, which seemingly travelled together often as the phones sent and received texts and phone calls. The maps showed cellphone activity pinging off towers near Millardair, Millard's farm in nearby Ayr, Ont., near places Smich stayed in Oakville, Millard's home in Toronto and Millard's mother's house in Kleinburg, Ont., where Bosma's truck was eventually found. On Wednesday, court heard Millard and Smich's phones -- and a third phone registered to a Lucas Bate that police believe is a bogus name -- travelled together from Toronto to Oakville to Hamilton and arrived near Bosma's home around 9 p.m. on May 6. Bosma's widow, Sharlene Bosma, previously told court two men came down their driveway shortly after 9 p.m. on May 6 and left for a test drive in their truck. Court has also heard police pulled two fingerprints from Bosma's truck that matched Millard's prints. The Crown alleges Bosma was shot inside his truck and later his body was burned in an incinerator.